One of the biggest misconceptions I encounter is that eating healthy is really expensive. Well sure, it can be, if you don’t shop smart. But that’s why I’m here. I’ve scoured the markets, made the mistakes, and learned the lessons for you. After years of trying to eat within a super strict budget, I’ve come up with these easy and practical tips to save money on produce and fill your plate with a rainbow of colors, even when your bank account is running on empty. Buying produce on a budget is all about picking the right items, at the right time, and in the right form, and it will likely be different for every person depending on where you live. Here’s a quick video introducing my techniques, but you can scroll down for a more in depth look at each tip, plus a few more! Okay, we’ve all heard this tip, but what does it actually mean and how does it save you money? In today’s global agriculture market, it’s a little more difficult to tell what is in season because many items are available year-round, but when produce that is grown in your region is in it’s harvesting season, you’ll notice a glut at the grocery store. That sudden increase in supply drives the prices down, all while providing you a fresher, more flavorful product than items that are technically grown “out of season” and half way around the world. Growing seasons differ from region to region, but if you keep your eyes open you’ll start to notice the patterns. Or you can consult any of the handy charts online, like this one from the USDA, to get a general idea. And if you do score a really super deal on seasonal produce, freeze it! Stock your freezer with your goods to use later and lock in that awesome in-season price. One of the easiest ways to save money on produce is to stick to sturdy fruit and vegetables. Delicate fruit and vegetables, like berries or baby greens, spoil quickly and therefore the growers and grocery stores carry a higher monetary risk to keep them stocked on their shelves. They cover that risk by raising the price. Instead, stick to sturdy vegetables that are very shelf stable, like cabbage, sweet potatoes, celery, onions, carrots, potatoes, kale, collards, apples, and oranges. Not only do they cost less at the store, but they’ll last longer once you get home, so you’re less likely to find them wilted in your crisper a day later. 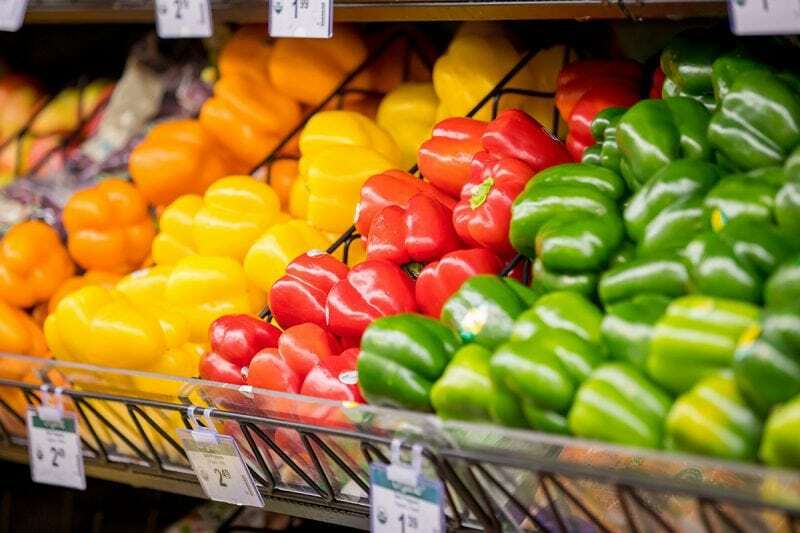 Grocery stores usually price produce one of two ways: per pound, or per item. This can make a big difference in the total cost. For instance, a bag of grapes may have a big sign that says $2.99, which sounds great, until you realize that’s actually per pound and that bag of grapes weighs three pounds! That’s a $9 bag of grapes! Paying attention to pricing method is also important when comparing packaged produce to loose produce. You may see a bag of carrots for $1 each and loose carrots for $1.49 per pound. Check the weight of the bag of carrots so you can compare the per pound price for both. Buying local is a huge trend, but it can also help you save money on produce! When produce has to travel across the country or across the globe the cost of that transportation gets absorbed into the price you’re charged at the checkout. As an added bonus, since regional produce has less distance to travel and can make it from farm to store faster, it’s usually picked closer to its peak ripeness and will have better flavor. So, tropical fruits and vegetables may be very inexpensive in the southern United States, but more expensive in the north, while cold weather fruits and vegetables, like apples and plums will be less expensive in the north and more costly in the south. Frozen fruit and vegetables can be an excellent budget saver. When produce is out of season or expensive for other reasons, I turn to the freezer aisle. Frozen produce is not only convenient because it’s often pre-chopped and ready to toss into a recipe, they have an extremely long shelf (freezer) life, so you don’t have to worry about them spoiling if you don’t use them up right away. When shopping for frozen vegetables, stick to the plain vegetables that don’t come with sauces or seasonings, and buy larger bags to save more! Some of the best places I’ve found for excellent quality produce at a low price are international markets. I haven’t quite figured out the why behind this, but I think it’s because other cultures use a lot more produce in their regular diet than Americans, so international markets have a higher turnover rate for their produce and can afford to stock better produce at a lower price. That’s just my guess, but whatever the reason, if you have a large Asian grocery or other international market in your area, check their produce! You may be pleasantly surprised. Also make sure to look into local CSAs (Community Supported Agriculture), and local farmers’ markets in your area. On average I’d say I spend around $1.50/lb. for produce, and sometimes far less. Compare that to that $4 bag of chips. The bag of chips may look big, but it weighs next to nothing. Meat and dairy are going to be at least twice as much per pound than produce, if not more. If you pick the right produce at the right time, it can be one of the least expensive items in the grocery store. Stock up, eat healthy, and be happy! Now that you’re a pro at getting tons of fruit and vegetables at a bargain, what do you do with it? Browse our Vegetable Category for recipes, or check the Ingredient Index to filter recipes by specific ingredient/fruit/vegetable. What are your favorite ways to save money on produce? Leave your tips for the other readers in the comments below! 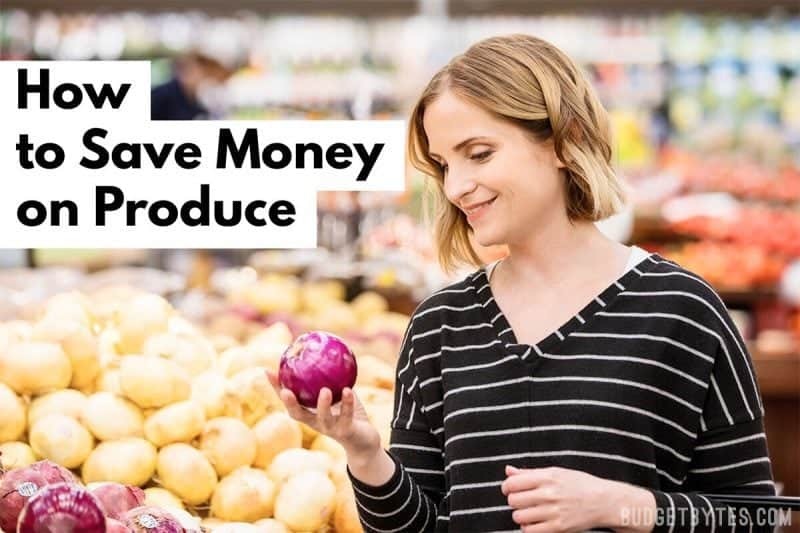 The post How to Save Money on Produce appeared first on Budget Bytes.